Tuesday, December 18, beginning with Mass at 6 p.m. 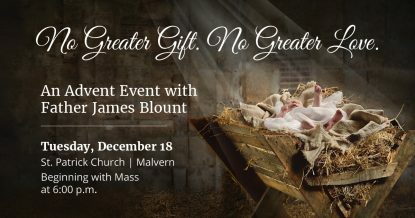 This Advent, join us as we welcome Father James Blount, SOLT, a gifted preacher who will help us explore how the gifts of the season — hope, healing, and peace — can be experienced in our times and realized in the promise of joy that awaits us in our Savior’s birth. Father Blount will be the celebrant at the 6 p.m. Mass, with St. Patrick’s pastor, Father Christopher Redcay, as concelebrant. The presentation by Father Blount will follow Mass, and exposition of the Blessed Sacrament with a healing service will conclude the evening.